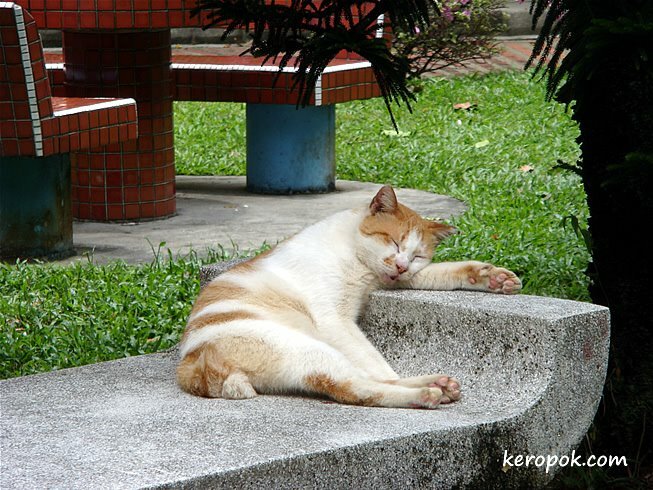 'Boring' Singapore City Photo: Humanised Cat..
My colleagues and I were walking back to the office after lunch and we saw this. Cats usually sleep curled or flat on the ground? This cat seems to have learned the human style of sleeping. Looking really really comfortable. He does look comfy. Great shot. haha. i bet it'll have hand cramps when it wakes. Great picture!! It's amazing the places and positions cats will sleep in. I often look at my cat sleeping in ways that look so uncomfortable and all I can think is, "If I slept like that, upon waking I would ache and not be able to stand up straight!" LOL! hahaha! I love this pic! He looks very funny and comfortble!